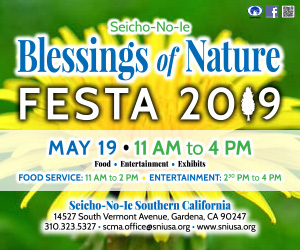 An ever-faithful child of the Lord, Eiko will be remembered for her ever-present smile and cheerful laughter, her grace, and her incredible strength of spirit. Eiko is survived by her husband Kazuhiko Matsuda; children Michael Matsuda and Yuko Diamond; sisters Michiko Tanaka, Shizue Fujii and Hisae Fukui; and brothers Daichi Kogiso and Tadaharu Kogiso. 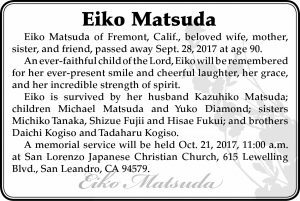 A memorial service will be held Oct. 21, 2017, 11:00 a.m. at San Lorenzo Japanese Christian Church, 615 Lewelling Blvd., San Leandro, CA 94579.